This article is about the horror film. For the Saddolls album, see Happy Deathday. Happy Death Day is a 2017 American black comedy slasher film directed by Christopher Landon, and written by Scott Lobdell. It stars Jessica Rothe, Israel Broussard, and Ruby Modine. The film was produced by Jason Blum through his Blumhouse Productions banner. The film is also in association with Digital Riot Media and Vesuvius Productions. It follows a college student who is murdered on her birthday and begins reliving the day repeatedly, at which point she sets out to find the killer and stop her death. Originally announced in 2007 under the title Half to Death, the film was released on October 13, 2017, by Universal Pictures. It grossed $125 million worldwide on a $4.8 million budget and received mostly positive reviews, with critics deeming the film entertaining while acknowledging the familiar premise, and describing it as "Groundhog Day meets Scream". A sequel, Happy Death Day 2U, was released on February 13, 2019. After a night of drunken partying, university student Theresa "Tree" Gelbman wakes up on her birthday in the dorm room of classmate Carter Davis. She ignores a phone call from her father and dismisses Carter, returning to her room. Her sorority housemate Lori Spengler gives her a cupcake, which she throws away. Tree meets with her married professor, Gregory Butler, with whom she is having an affair. That night, on her way to a party, Tree is lured into a tunnel and murdered by a figure wearing a mask of the school mascot. Tree immediately wakes up back in Carter's bed, and is unnerved to find the previous day's events repeating themselves. Baffled, she relives the day, this time avoiding the tunnel and reaching the party. However, the masked killer follows her to the party and murders her again. Tree again wakes up in Carter's bed, realizes she is in a time loop, and barricades herself in her room to avoid death. The killer, already hiding inside, slays her a third time. Waking up, Tree explains the events to Carter. He suggests taking advantage of the loop to identify her killer. She spends the next several iterations trailing people she considers suspects but is killed each time. After waking from a loop where she is bludgeoned, Tree faints and awakens in the campus hospital. Her body shows evidence of recovery from multiple traumatic injuries, indicating she has retained physical damage from her previous deaths. When the killer shows up, Tree escapes the hospital in Gregory's car, only to be pursued and killed again. Back in Carter's bed, Tree convinces him of her predicament by demonstrating her knowledge of the day's events. Tree admits to harboring tremendous self-loathing, particularly from pushing away her father after the death of her mother three years ago. Tree sees a local news report on John Tombs, a serial killer being held at the campus hospital. Concluding that Tombs is her killer, Tree rushes to the hospital to warn of his escape. Tombs breaks free and nearly kills Tree, but Carter follows and rescues her. Tombs kills Carter before chasing Tree to a nearby bell tower, where she subdues him with a crowbar. Realizing that Carter will remain dead if she ends the loop, Tree hangs herself. Believing she has solved her murder, Tree proceeds happily through the day. She ends her affair with Dr. Butler, and meets her father for lunch, where the two begin to reconcile. That night, she goes to the hospital and traps and kills Tombs. Relieved to finally be free, she celebrates her birthday in Carter's room and eats the cupcake given to her by Lori. Tree wakes up still in the loop; angry and confused, she returns to her room, where Lori offers her the cupcake again. Tree realizes the previous loop was the only time she had ever eaten the cupcake, and had died in her sleep. Tree realizes Lori is the true killer. Lori had poisoned the cupcake, but when Tree failed to eat it, Lori utilized her job as a nurse at the hospital to frame Tombs for Tree's murder. Tree threatens to take the cupcake to the police, but Lori attacks her. She admits to also having an affair with Dr. Butler, whose preference for Tree drove Lori mad with jealousy. In the ensuing fight, Tree stuffs the poisoned cupcake in Lori's mouth, then kicks her out a window to her death. At a restaurant, Tree and Carter muse over the day's events and he offers her his room for the night. The next day, Tree wakes up believing she is still in the time loop as a result of a prank by Carter, but he quickly reveals that it is the next day at last. Tree is too relieved to be angry at him, and the two kiss. The movie was in pre-production or soft production at the time, and I came on and I loved the concept of the movie. I loved the idea of a girl, trapped in a time loop who has to solve her own murder. – Director Christopher Landon about the concept of the film. The film was first announced in July 2007, with Megan Fox attached to star. The film was originally titled Half to Death, produced by Michael Bay and Rogue Pictures, and directed by Antti Jokinen. Christopher Landon was hired to rewrite the Scott Lobdell screenplay, and while he liked the reworked script the studio decided to not move on with it. The project was only revived years later, as original producer Angela Mancuso had lunch with Landon and remembered about Half to Death. Landon decided to send the script to Jason Blum of Blumhouse Productions, with whom he had worked in the Paranormal Activity sequels, and he approved it, leading to a green-light by Universal Pictures. Blumhouse announced the project on October 11, 2016, with Landon directing and Jessica Rothe cast in the lead role of the film. On November 8, 2016, it was announced that Ruby Modine, Charles Aitken and Rachel Matthews had joined the cast, alongside Rothe and Israel Broussard. 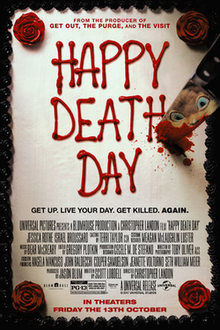 The film got eventually retitled Happy Death Day in June 2017. The mask was constructed by Tony Gardner, the same man who built the "Ghostface" mask from every Scream film, and its design was personal. Landon explains, "During preproduction ... I was expecting my first son. I don't know if I just had babies on the brain, or if I was subconsciously scared to become a father, but that baby image was floating around in my head. Tony made us a pig mask, too, but when I wore the baby mask in the office, I scared a co-worker, and we thought ... yeah, this is it. This is the one." Scream itself was listed among the influences Christopher Landon took for the film, along with Halloween (1978), Groundhog Day and comedies of the 1980s such as Sixteen Candles and Back to the Future, given he aimed to make a "fun, silly horror movie". He also aimed to emulate the protagonist's personal growth in Groundhog Day to comment on "this age of social media and all the crappy things that kids do to each other". Comic book writer Scott Lobdell said he wanted to play with the tropes of the slasher genre, as according to him "every slasher film opens up with the mean girl getting killed and the good girl living till the end. And I thought, 'How can I make the mean girl and the good girl the same person?'" In the original draft, Lori and Dr. Butler were the killers together. Landon says, "They were a psycho couple murdering Tree together. That ultimately didn't work for me. I thought Gregory was a great opportunity to be a suspect. To make him a killer, it didn't help me. That was a change I really wanted to make." Also, in the original draft there was no birthday, and no romance, which Landon added to humanize Tree. Landon decided to shorten the protagonist's name Teresa into Tree, which also conveyed her character arc as "trees need to grow and you see this character go from one person to another". Filming took place at and around Loyola University in New Orleans, Louisiana, and it lasted 5 weeks. The scenes where Tree awakens in Carter's bed after her death were filmed back to back in a span of two days. The scene after Tree pushes Lori out the window was supposed to be at the sorority house, but the filming permit was over before production was able to shoot there, forcing the location to be changed into a Los Angeles diner also featured in another Blumhouse production, Split. In the film's original ending, Tree is taken to the hospital after her encounter with Lori. The doctor instructs Tree to stay away from pain medication for at least a day due to the extent of her injuries. After he leaves, a nurse comes in and says she is giving Tree something for the pain. Tree informs the nurse of the doctor's orders. The nurse reveals herself to be Dr. Butler's wife, Stephanie, who says it is for her own pain. She then murders Tree in revenge for her husband's affair with the girl. This version was shown in the test screenings for the film and was received negatively by the audience, which led the writers to come up with the theatrical ending. Director Christopher Landon also revealed Lori and Dr. Butler were the killers in the rough drafts, which later inspired the idea of the poisoned cupcake. Bear McCreary composed the score of Happy Death Day. Reflecting the film's blend of horror and comedy, McCreary stated that he wanted "a schizophrenic, dual personality, with light-hearted comedic scoring on one end, and genuinely terrifying soundscapes on the other." This approach is highlighted by the two main leitmotifs, an energetic theme for Tree evoking contemporary pop music, and one for the killer that consists of distorted vocals provided by McCreary's young daughter Sonatin. The percussion in the score are mostly sampled from college marching band drum lines to evoke the collegiate setting. While the film's trailer featured 50 Cent's "In Da Club" as Tree's ringtone, Landon said the film could not afford to use the track, but still preferred the eventual song music supervisor Andrea von Foerster improvised, the comedic "Busy Day Birthday". Happy Death Day grossed $55.7 million in the United States and Canada, and $69.8 million in other territories, for a worldwide total of $125.5 million, against a production budget of $4.8 million. In the United States and Canada, Happy Death Day was released alongside Marshall, The Foreigner and Professor Marston and the Wonder Women, and was expected to gross $15–20 million from 3,130 theaters in its opening weekend. It made $1 million from Thursday night previews at 2,450 theaters, similar to fellow Blumhouse release The Visit ($1.05 million in 2015) and $11.6 million on its first day, increasing weekend projections to $26 million. It went on to debut to $26 million, topping the box office, making it the third Blumhouse Productions film of 2017 (after Split and Get Out) to do so. It fell 64% in its second weekend to $9.4 million, finishing in third behind newcomers Boo 2! A Madea Halloween and Geostorm. On review aggregator website Rotten Tomatoes, the film has an approval rating of 71% based on 136 reviews, with an average rating of 6.1/10. The site's critical consensus reads, "Happy Death Day puts a darkly humorous sci-fi spin on slasher conventions, with added edge courtesy of a starmaking performance from Jessica Rothe." On Metacritic, the film has a weighted average score of 58 out of 100, based on 26 critics, indicating "mixed or average reviews". Audiences polled by CinemaScore gave the film an average grade of "B" on an A+ to F scale, while PostTrak reported filmgoers gave it a 52% "definite recommend". Critics noted that although the film makes laudatory attempts at merging genres—including romantic comedy, horror and "campus satire"—the end results were mixed. Jamie East from The Sun likened it to a "slasher Mean Girls," while Chris Agar of Screen Rant said that the "fun, if silly, blending of genre tropes ... ends up being a double-edged sword." The film was released on digital HD on January 2, 2018, and was released on DVD and Blu-Ray on January 16, 2018. The home release also includes the original ending. Director Christopher Landon talked about the possibility of a sequel, focusing on why Tree went into a time loop. Jessica Rothe stated that while most horror sequels retread the original, Landon's pitch instead "elevates the movie from being a horror movie into a Back to the Future type of genre film where the sequel joins us right from where we left off, it explains a lot of things in the first one that didn't get explained, and it elevates everything." The sequel was officially announced with filming scheduled to begin on May 10, 2018. Most of the original actors returned, including Rothe, Modine, Broussard, and Matthews. In addition, Suraj Sharma and Sarah Yarkin were cast. The sequel titled, Happy Death Day 2U was released on February 13, 2019. ^ a b c "Happy Death Day (2017)". Box Office Mojo. Retrieved December 9, 2017. ^ Miska, Brad (April 20, 2017). "Get Scared 'Half to Death' This October". Bloody Disgusting. Retrieved April 20, 2017. ^ a b Giles, Jeff (October 12, 2017). "Happy Death Day Is Familiar but Fun". Rotten Tomatoes. Retrieved October 13, 2017. ^ a b c D'Alessandro, Anthony. "Blumhouse Has Plenty To Smile About As 'Happy Death Day' Scares Up $26M+ Opening". Deadline Hollywood. Retrieved October 15, 2017. ^ a b c "How it took nearly 10 years to make the horror movie 'Happy Death Day'". October 4, 2017. ^ "EXCLUSIVE: Megan Fox Joins Half to Death". Beyond Hollywood. July 15, 2007. Archived from the original on September 28, 2017. Retrieved September 27, 2017. ^ McNary, Dave (October 11, 2016). "Jessica Rothe Starring in Horror Movie 'Half to Death'". Variety. Retrieved April 20, 2017. ^ McNary, Dave (November 8, 2016). "Ruby Modine Joins Horror Movie 'Half to Death'". Variety. Retrieved April 20, 2017. ^ Busch, Anita (June 12, 2017). "Universal, Blumhouse Retitle Film Half To Death To Happy Death Day". Deadline Hollywood. ^ a b "THE STORY BEHIND 'HAPPY DEATH DAYS CREEPY BABY MASK AND TREE'S BEST LINES". October 12, 2017. Retrieved October 17, 2017. ^ "Happy Death Day Influences: 10 Movies That Inspired the Director". ^ a b "'Happy Death Day' Ending: Director Shares Sequel Plans for Part 2". The Hollywood Reporter. October 15, 2017. ^ "Happy Death Day's Jessica Rothe On What It Means To Be A Scream Queen in 2017". ^ Philip, Tom (October 18, 2017). "Happy Death Day Star Jessica Rothe Explains What It's Like to Die a Dozen Times in the Same Movie". GQ. Retrieved October 19, 2017. ^ "Happy Death Day Shot An Original Ending That Made Test Audiences Furious". Cinema Blend. October 16, 2017. Retrieved January 21, 2018. ^ "Happy Death Day (Original Motion Picture Soundtrack) [Bonus Track Version]". iTunes Store. October 13, 2018. Retrieved February 16, 2018. ^ "'Happy Death Day' expected to unseat 'Blade Runner 2049' at the box office". Los Angeles Times. October 11, 2017. Retrieved October 11, 2017. ^ "Blumhouse Makes a Wish for Another #1 Opener with 'Happy Death Day'". Box Office Mojo. October 12, 2017. Retrieved October 13, 2017. ^ D'Alessandro, Anthony. "'Boo 2! A Madea Halloween' Reaps $21M+ During October Dumping Ground At The B.O." Deadline Hollywood. Retrieved October 22, 2017. ^ "Happy Death Day (2017)". Rotten Tomatoes. Fandango Media. Retrieved February 20, 2019. ^ "Happy Death Day Reviews". Metacritic. CBS Interactive. Retrieved October 21, 2017. ^ Robey, Tim (October 19, 2017). "Happy Death Day review: slasher Groundhog Day gives us a scream queen for the ages". The Telegraph. ISSN 0307-1235. Retrieved October 20, 2017. ^ "Like a slasher Mean Girls, Happy Death Day nails comedy and horror". The Sun. October 19, 2017. Retrieved October 20, 2017. ^ "Happy Death Day Review". Screen Rant. October 13, 2017. Retrieved October 20, 2017. ^ Acuna, Kirsten (October 1, 2017). "'Happy Death Day' isn't out yet, but the director already has an idea for a sequel". Business Insider. Retrieved October 22, 2017. ^ "'Happy Death Day' Sequel Reportedly Filming This Summer". March 16, 2018. Retrieved March 18, 2018. ^ "Happy Death Day 2 Sets Cast & Confirms Filming Start Date". ScreenRant. May 1, 2018. ^ "'Happy Death Day 2': Jessica Rothe, Israel Broussard Return; Suraj Sharma & Sarah Yarkin Joining Blumhouse Sequel". Deadline. Retrieved May 1, 2018.